Hanging System for your home … an indulgence? We’ve been redecorating at my house this summer. Redecorating is not for the faint of heart. You change one thing, then another. Suddenly you are down the rabbit hole of what we call “home change” — and there is no end in sight. But there is one thing people can do relatively quickly, without new paint or subway tile… and that is rearrange your artwork. At this point people (gasp!) People seem to assume that art placement in their house is something sacred, that can never be changed unless they move. I think this is a recipe for personal stagnation. But I am sympathetic to these feelings, in that I have a dear spouse who is convinced that everything I hang on our drywall walls requires a screw and an expansion bolt. I stand before you today and say – that is simply not true. You either need some different nails (more about that later) or better yet, your own hanging system. My living room with its new hanging system. Everything is hung appropriately, with no unsightly holes. • Four white metal channels are now installed on three different walls, just below the ceiling. • I chose stainless steel cables, because I have had experience with the clear nylon cables getting nicked and worn. • Self gripping hooks with safety guards were my choice for hangers. • I made sure to order enough cables and hooks so that the work could be hung from the D-rings on the back of my frames. This helps to hold the work close to the wall, and resist shifting when someone slams the mudroom door. A hanging system requires no hammer and no math. Just your keen eye, an assistant and maybe a level. 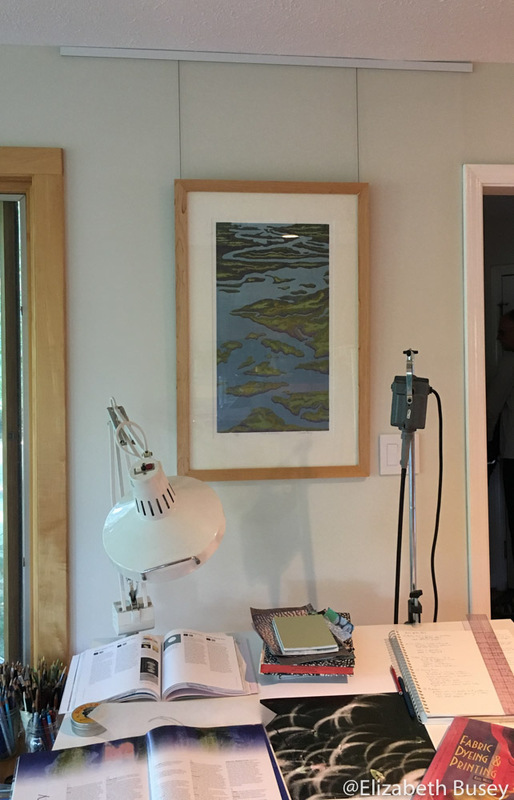 I love being able to change the artwork above my drawing table. Now it is easy to change the decor of the majority of our living space without nail holes and pesky measuring. A delight! Admittedly this system wasn’t inexpensive, costing about $250. But since I was hanging heavy work framed in glass, I was willing to invest a bit more in something that will probably be installed long after we no longer live here. What can you do if you can’t make this investment? Get some OOK nails from the hardware store. These nail and hook sets are easy to use, and twist out when you want to remove them. They leave a small hole that will need to be filled, but don’t require removal with the claw of a hammer which then further damages your walls. I used them to hang my gallery show in April, and they were flawless. Be sure to use two for very long horizontals so your frame doesn’t shift constantly. So please, do your home a favor and mix up the artwork. It is much cheaper than moving. 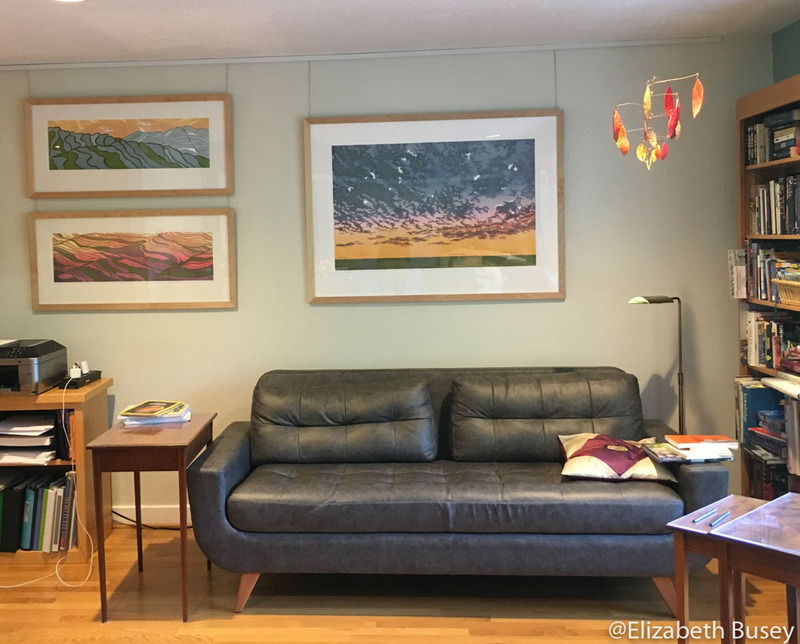 This entry was posted in Exhibits and tagged artwork, decorating, hanging system, nails on September 27, 2017 by Elizabeth Busey. How do you make creative work in a time of chaos? This blog post is a long time coming. Stuck in my throat for months, today is the day when the not writing becomes more painful than the writing. I’ve been asking myself this question for the better part of nine months, without coming to any conclusions. Over the past months, I have felt my energies pulled in areas where I am deeply concerned, but powerless to affect in an immediate sense. I have felt this from my audiences as well. It takes energy to engage with artwork. When you have spent your emotions for the day by calling your elected officials, or trying to engage with your racist cousin, you want nothing else than to sip your purchased wine and stroll past art festival booths without going in. Elizabeth Busey. Great Unknown. Reduction linocut on Rives BFK. 18 x 18 in (image size), ed of 21. I get it. I feel that way as well. Instead of throwing myself into my materials and the swirling worries of the day, it is easier to numb my brain watching energetic people flip houses in thirty minutes to an hour. If only a fresh coat of paint, some exposed shiplap and a new backsplash of subway tile would wash away the horrors of each day’s news headlines. Making things new. Making things better. These are valid, even valuable goals to have. But what if what I “do” now seems superfluous, even vapid and shallow? Should I create more? Should I press on with my body of work and wait until the skies clear? Some would argue that your work should speak to the times. How I envy people whose artistic vision can dovetail seamlessly and speak directly to all of the pain, fear and anger that has arisen in the United States. Perhaps my work is an antidote to all of these feelings, but right now that does not seem to be enough. I visited the Catalan region of Spain this summer with my husband. We spent time in the cities of Barcelona and Girona, and hiked in the Benasque region of the Pyrenees. I saw the works of the native sons of the region — Picasso and Miro. I’m not a devotee of either artist, but it was illuminating to see their progression as artists at museums that housed their work. What was more illuminating in this trip was learning about the Spanish Civil War. Both cities still had public bomb shelters that were now contained in city parks. Plainly said, these shelters were built to protect the citizens from the bombs of their own government. Both Picasso and Miro escaped to France during the Spanish Civil War. Picasso painted his famous protest painting Guernica in 1937 in Paris, a protest of the German bombing of the city of the same name. Some people today will create work in the vein of Picasso’s Guernica. That will be valuable. Yet most of us would not like this image to greet us daily on our living room walls. Is creative work that is calm, peaceful, rejuvenating, or even hopeful appropriate today? Necessary? I would like to think that it is. 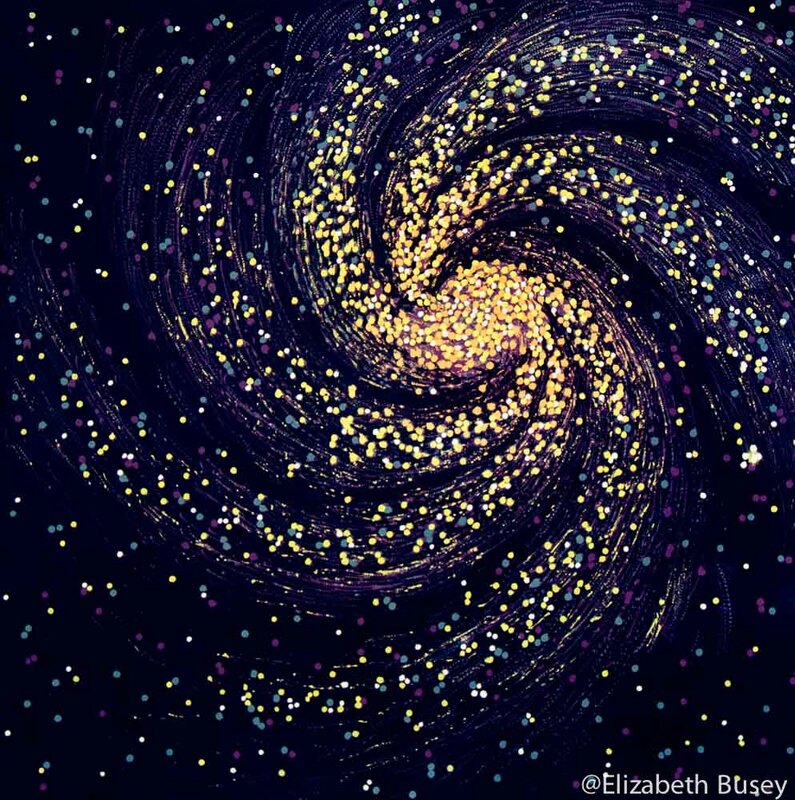 This entry was posted in Inspiration, Uncategorized and tagged artwork, chaos, Guernica, Picasso, politics on August 16, 2017 by Elizabeth Busey. Late summer is a time of letting go in the college town where I live. Parents drop off their students and have to walk away. They must trust that their children will eventually find their way by themselves. From experience, I know this is difficult to do — so much is unknown. It turns out that this experience is similar in showing my artwork. I have been invited to show work in two upcoming shows, located in Lafayette, IN and southwest Chicago. I loaded my RAV4 with three large works laying flat, and five small pieces tucked behind the front seats. I set off with a friend to begin delivering this work. Instead of speeding north, we were eventually detoured onto back country roads, where we spent an hour with intermittent cell service, snaking our way past orchards and through state forests. “What does this have to do with making art?” I thought to myself. Snaking through back roads and forests, trying to get to points north. Delayed more than an hour, we finally drop off one piece and begin the longer part of the journey toward the Argonne National Lab outside of Chicago. Instead of the swift journey forecast by Google Maps, we experienced more delays… and trucks! 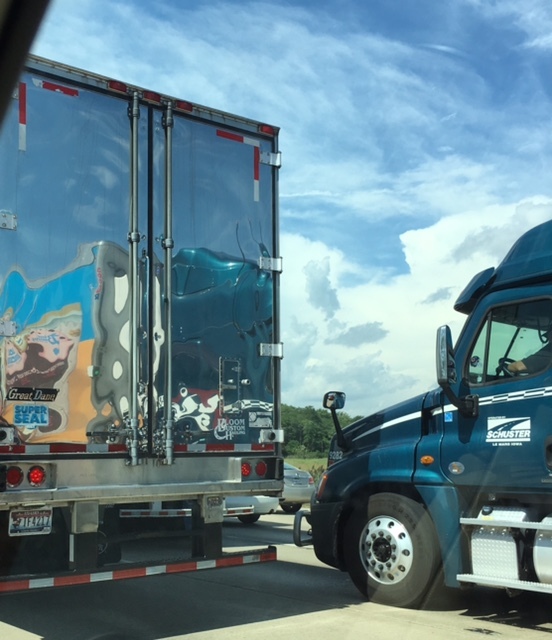 We were always surrounded by trucks as we inched north and west of Chicago. What was I doing here? Why was I not home carving and printing? 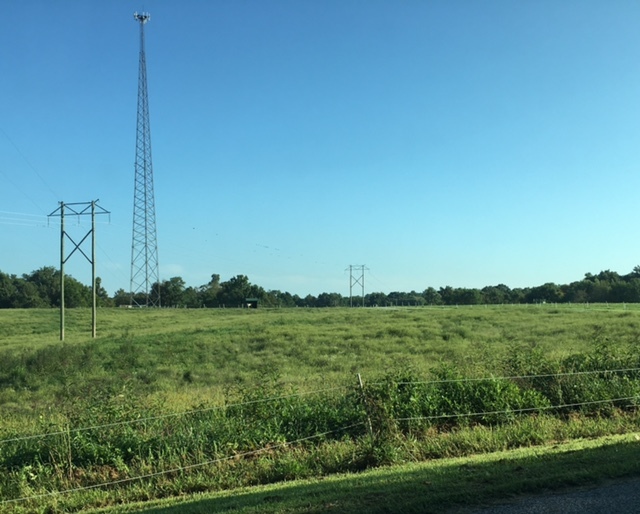 After seven hours, we finally pull into the Argonne National Lab, and are greeted by large brick gates, lots of fencing, and a tiny visitor’s center. This is as far as I can go with my art. There is a small area to leave the artwork, which will be moved to the lab’s gallery later in the week. Now I’m nervous. I have carefully transported my larger work flat, to avoid stress on the frame’s corners. All I can do now is prop them gently against a wall, and pin a note explaining how they need to be moved. 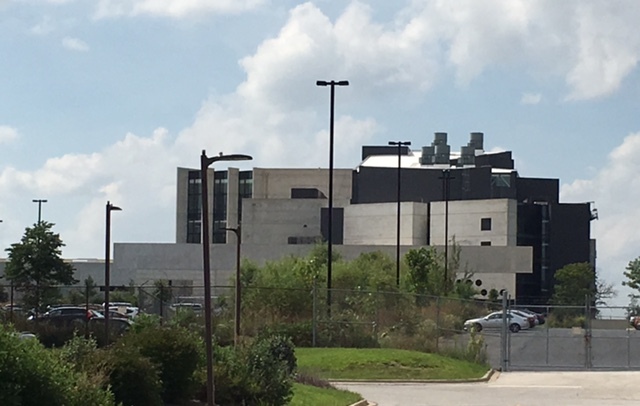 Distant view of the Argonne National Lab. Was the gallery in this building? When I deliver artwork, I usually bring the work into the space and meet the people who will be installing the exhibit. Argonne National Labs is a collaboration between the University of Chicago and the U.S. Department of Energy so in retrospect it makes sense that we left the artwork outside the facility as we were not cleared by security nor escorted. My friend later suggested that the art would be inspected as well. Just as parents cannot find out information about their student’s classes, professors and grades, I must trust my artwork in the hands of others. Not an easy thing to do. Consolation often comes with sugar. It just does. What do you do when you must let go? Empty nesting parents redecorate, or go on a much needed vacation. The accidents and congestion faded away for our return drive, and we were treated to Simpson’s clouds as we neared the Indiana line. 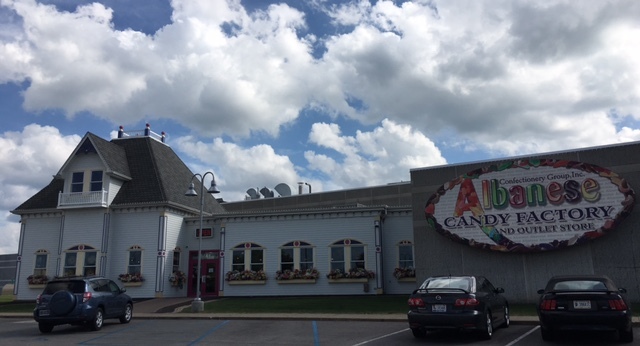 A stop at the Albanese Candy Factory — home of the world’s best gummy bears — lifted our spirits and made the journey home a bit sweeter. I hope to get back up to the Argonne National Lab to attend the opening. Like Parent’s Weekend this will be my opportunity to convince myself that the artwork is doing just fine without me. This entry was posted in Exhibits, Travel and tagged artwork, delivery, exhibits, transporting, trust on September 9, 2016 by Elizabeth Busey. To truly live as an artist, I believe I have to not only create something, but also share it with others. I had a splendid weekend meeting people at the Fourth Street Festival who wanted to have my art in their homes. I even delivered several pieces to homes for potential collectors to consider for the week. I see my work as adding to their well-being through their home environment. Elizabeth Busey. Fibonacci. Reduction Linocut, 18 x 18in, Ed of 22. 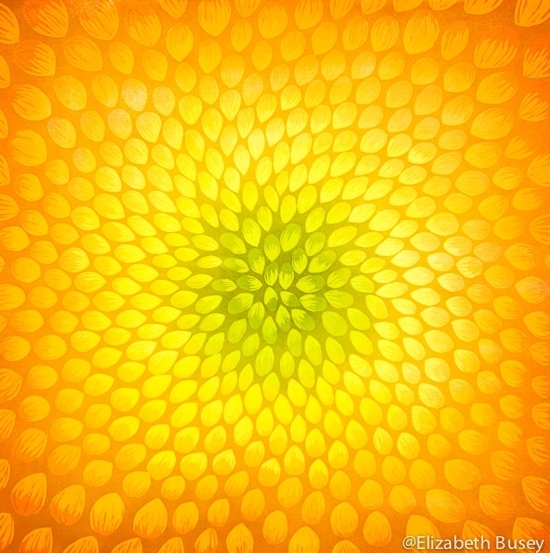 This entry was posted in Art as Connection and tagged artwork, breath, Fibonacci, healing, time, well-being on September 10, 2015 by Elizabeth Busey.